The overarching theme of this volume is one of the central concerns of syntactic theory: How local is syntax, and what are the measures of syntactic locality? It is argued here that movement and anaphoric relations are governed by a unified concept of locality: the phase. 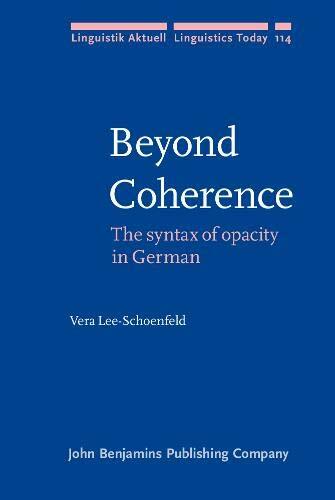 On an empirical level, <i>Beyond Coherence</i> brings together three strands of research on German syntax: &#x2018;coherence&#x2019;, the study of (reduced) infinitive constructions; the possessor dative construction, with a dative nominal playing the dual role of possessor and affectee; and binding, the distribution of anaphors and pronominals. These apparently disparate areas of research intersect in that the locality constraints on the possessor dative construction and binding allow the two phenomena to serve as probes for infinitival clause size. Offering a Minimalist &#x2018;possessor raising&#x2019; and phase-based binding account, this work culminates in a discussion of the phase as the key to the various opacity effects observed in the book.